Collector’s note: I’m bringing in four different items related to Bill Garrett’s career at Indiana in this post. The quintessential piece is the signed photo personalized to fellow IU athlete and friend, Jack Dolan, who played football at Indiana. Garrett, who died in 1974, is not a typical IU signature you see come up often for sale. What’s even more scarce is a signature on an IU-related photo. I have seen a few signatures featuring Garrett in a Harlem Globetrotter uniform, but only two other signed photos exist (that I’m aware of) featuring Garrett in an IU uniform. This Saturday, April 8th, a dedication ceremony will take place on the Indiana University campus to honor Bill Garrett with a Indiana Historical Bureau marker, which will reside outside the Old Fieldhouse, now known as the Ora L. Wildermuth Intramural Center. Tom Graham co-authored the book Getting Open: The Unknown Story of Bill Garrett and the Integration of College Basketball. He was also a driving force behind the historical marker becoming a reality. Mr. Graham joined Jerod Morris on The Assembly Call to discuss the ceremony, Bill Garrett’s remarkable story, and why the placement of the marker outside a building named after a proud racist like Ora Wildermuth might seem inappropriate but is actually perfect. The marker will commemorate Bill Garrett breaking the Big Ten Conference “gentlemen’s agreement” that barred African Americans from playing Big Ten basketball. The marker is long overdue. Garrett’s achievements both on and off the court might be known to the most die-hard Hoosier fan, or perhaps even the casual Indiana basketball fan. However, too many are not fully aware of the major impact he made with his four years in Bloomington. Garrett, the 1947 Indiana “Mr. 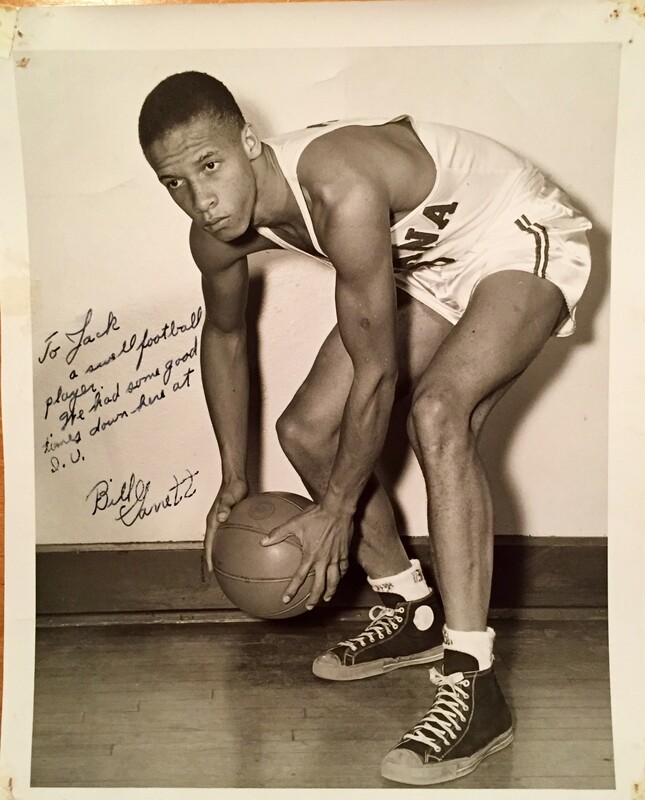 Basketball” and state champion at Shelbyville High School, arrived in Bloomington in the fall of 1947. However, Garrett wasn’t arriving as a key member of IU coach Branch McCracken’s incoming crop of players. In fact, Garrett, arrived with only an “opportunity” to make the team, if he proved his worth. Players at that time would not be eligible to play as freshmen, meaning Garrett would have to prove his ability on the freshman team, which he did immediately. A 1948-49 Indiana schedule, Bill Garrett’s first season at Indiana. Eligible for varsity play during his sophomore season (1948-1949), Garrett started from day one and played center. The previous season, which was McCracken’s second season back at IU after a stint serving in the Navy in WWII, the Hoosiers had finished a dismal 8-12 overall, and tied for last place in the Big Ten Conference with Northwestern. Needless to say, the hope was that Garrett would be able to come in and make an impact right away. Garrett would go above and beyond proving to McCracken, the university, and to the rest of the Big Ten that he belonged on the floor, averaging a team high 10 ppg while the Hoosiers went go 14-8 overall (6-6 in conference play). 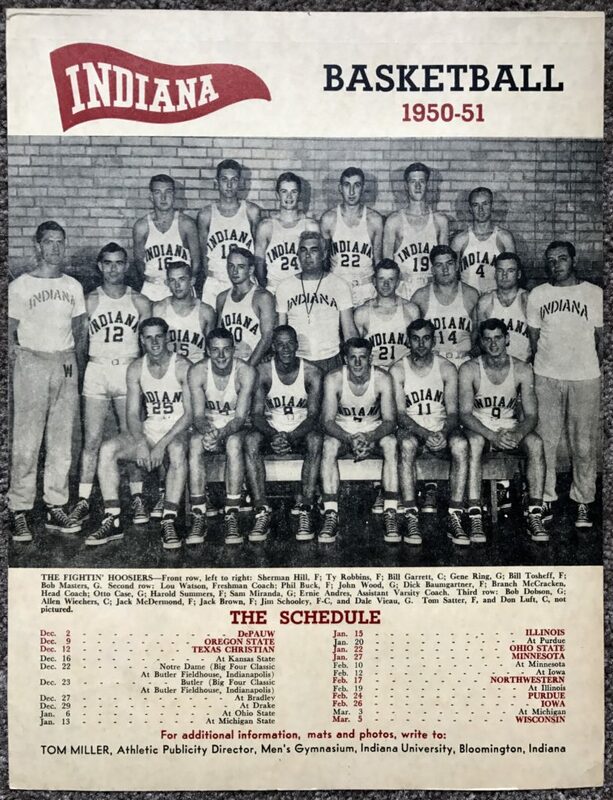 Indiana got off to a red-hot start during the 1949-50 season, going 10-0. And once again, Bill Garrett was clearly the most talented and athletic player donning the Cream and Crimson. He again led the team in scoring with a 12.9 ppg average. Garrett was not the lone talent on the floor for the Hoosiers that season as senior Lou Watson and Attica native Jerry Stuteville also provided firepower. Following Indiana’s hot start, reality set in as IU struggled to a 7-5 record in conference play, good for 3rd place. Watson, who earned All-Big Ten and All-American honors, as well as Stuteville, graduated, leaving many questions remaining entering the 1950-51 season. Bill Garrett had become a household name not only on the IU campus, but throughout the state of Indiana. While his play on the floor impressive, his ability to maintain his composure in hostile environments during road games was even more striking. Big Ten players and fans were more accustomed to seeing Garrett. Some had come to respect him; all had learned he could not be rattled by taunting. 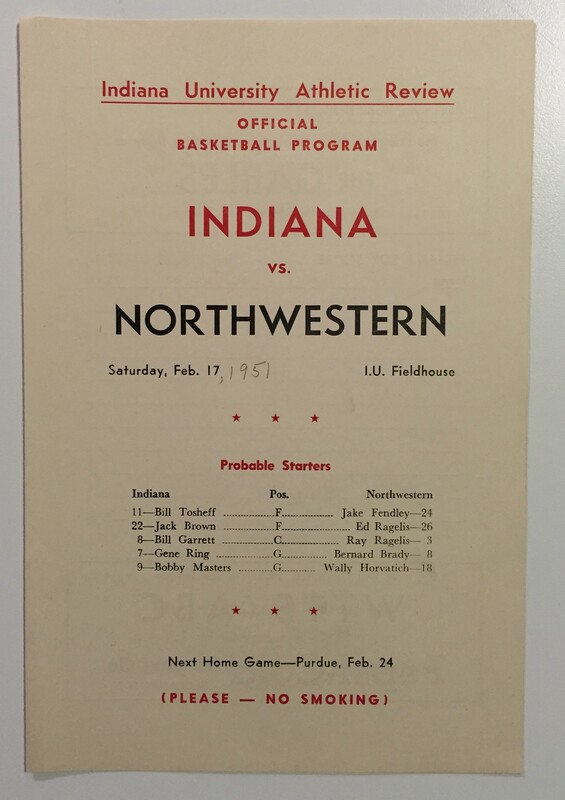 A 1951 Northwestern at Indiana program. Garrett would lead Indiana with 22 points in the 94-63 blowout. Entering his senior year at Indiana, Bill Garrett would once again be called upon to go above and beyond his role as Indiana’s under-sized, but extremely athletic center. Indiana’s entire team lacked size, and would thus have to depend on speed and athleticism to compete for a conference title. After a quick 6-0 start, Indiana was ranked #4 in the country just prior to Christmas break. On December 27th, Indiana faced top-ranked Bradley in a game that was a nail-biter from start to finish. IU would eventually fall to the Braves, 64-62, for their first blemish of the season. Indiana then reeled off six straight victories to begin conference play, including a 69-59 victory over Ohio State in which Garrett scored 17 points to lead the Hoosiers. Following a tough loss in Minneapolis (61-54), in which Minnesota proved that a larger lineup could pose challenges for the smaller Hoosiers, Indiana would win its next two games against the likes of Iowa and Northwestern before facing off against Illinois. The Hoosiers and Illini were clearly the top two teams in the conference, and with both teams having h only one conference loss, the winner of this contest would most likely end up with the title. Bill Garrett was in foul trouble most of the game, and ultimately fouled out with under ten minutes to go, which allowed Illinois to take charge in the paint, ultimately leading to a 71-65 win. In his finale at home wearing an Indiana uniform, Garrett scored a game-high 21 points in a 68-58 victory over Wisconsin. The result proved meaningless, as Illinois won their final contest against Michigan State on the same day to claim the conference crown. It was a sad, proud, emotionally drained crowd of ten thousand that cheered loudly when Jack Brown and Phil Buck left the game. Then came Gene Ring, to intense applause. Tension built until, with two minutes to go, the clock stopped for a free throw and McCracken waved in Don Luft, a reserve center. 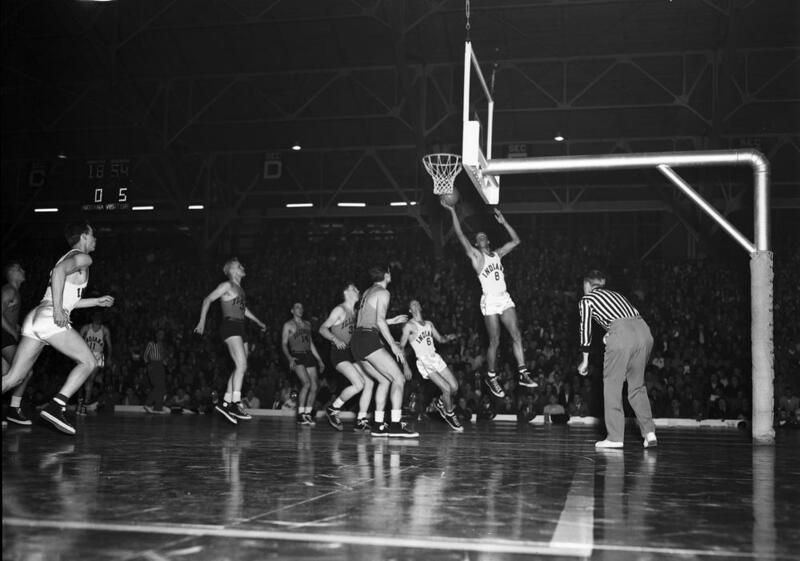 The instant Luft peeled off his red satin warm-ups and hopped onto the raise floor the crowd knew what was coming, and by the time Luft reached midcourt and touched hands with Bill Garrett, all ten thousand were on their feet. The outpouring, impulsive and cathartic, went on for almost two minutes, momentarily freezing referees and players as Garrett stepped down from the court to the bench, then back up again on to the edge of the floor, looking at his coach, his feet, and his teammates until they surrounded him protectively and the referees stepped in to break the spell out on the court. It was a moment those who were there would remember the rest of their lives. 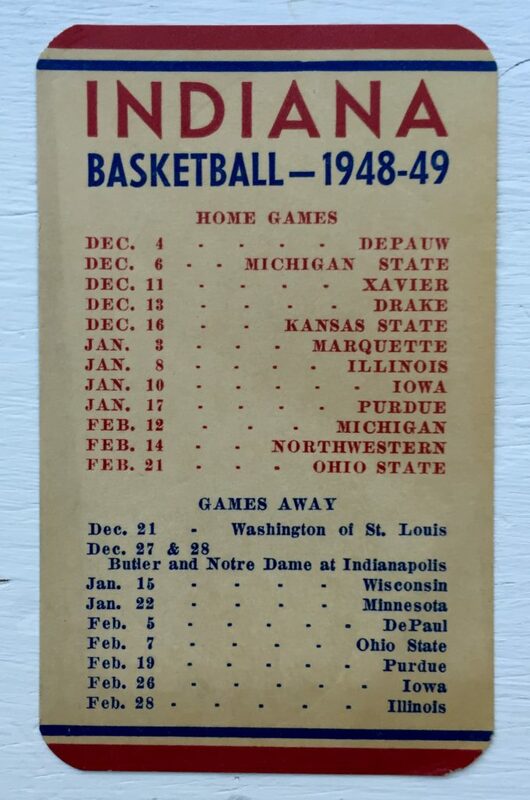 A 1950-51 Indiana basketball schedule stand-up display. Following his Indiana career, Garrett was drafted by the Boston Celtics before ending up as a member of the famed Harlem Globetrotters for three years. Garrett then returned to Indianapolis to become head coach and teacher at Crispus Attucks High School. He led Crispus Attucks to a state championship title in 1959, and to this day is the only Indiana Mr. Basketball recipient to win a state championship as a player and as a coach. Chris is a 2006 graduate of Indiana University. He is an IU memorabilia historian, consultant, and avid collector, and posts regularly about IU sports memorabilia and history on Twitter under the handle @IUArtifacts. Email Chris at gloryforoldiu@gmail.com.